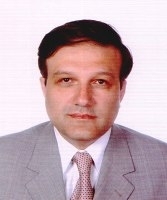 Ambassador Extraordinary and Plenipotentiary of the Republic of Armenia to the Arab Republic of Egypt Dr. Armen Melkonian was appointed Ambassador of the Republic of Armenia to the Arab Republic of Egypt by presidential decree on July 22, 2009. Prior to assuming this position, Ambassador Melkonian served as Head of the Middle East Department at the Ministry of Foreign Affairs since 2006. In that capacity he was in charge of policy formulation and implementation of bilateral political, economic and cultural exchanges with the countries of the specified region. In 2007 Ambassador Melkonian was granted diplomatic rank of Minister Plenipotentiary. He was Director of the International Relations Department of the Mother See of Holy Etchmiadzin, Catholicosate of All Armenians from 2001-2002 and was responsible for organization of the Catholicos's official visits, meetings and public relations. Ambassador Melkonian started his diplomatic career in 1994. His assignments abroad included three years as the Counselor of the Armenian Embassy in Cairo from 1994 to 1997, followed by a term as the Consul General of the Republic of Armenia in Los Angeles (USA) from 1998 to 2000 and Consul General in Aleppo (Syria) from 2002 to 2006. In addition to his diplomatic service, Ambassador Melkonian was a lecturer on Historical and Cultural Relations between Armenia and Arab World at the Faculty of Oriental Studies of the Yerevan State University since 1990. He also worked as senior expert at the Press-service of the Staff of the President of the Republic of Armenia from 1992 to 1993 and then Assistant to the President of Armenia from 1993 to 1994. Ambassador Armen Melkonian is the author of several articles on Armenian-Arabic historical and cultural relations. He graduated from the Yerevan State University, Faculty of Oriental Studies in 1980. He received a PhD in History from the National Academy of Sciences of Armenia in 1990. Beside his native Armenian, Ambassador Armen Melkonian is fluent in Russian, English and Arabic. Ambassador Armen Melkonian was born in 1958 in the capital of Armenia Yerevan. Married to Mrs. Yevgenya Melkonian, has a son and a daughter.